Our very own Pearl Embellishments! These brand new Pearl Jars by Sentimentally Yours are perfect for cardmaking, scrapbooking, mixed media and so much more! 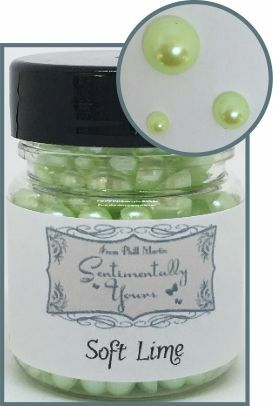 Featuring loose flat backed pearls in 3 sizes in 1 jar! Lets face it, we all use a bit of glue to stick our pearls onto our projects, whether they are self adhesive or not!, so we decided it was better to have these loose, so we can do just that. These are very high quality pearls, with a beautiful pearly finish and currently available in 18 stunning colours! Even better, there are approx 550 (yes, 550!) pearls in each jar! !